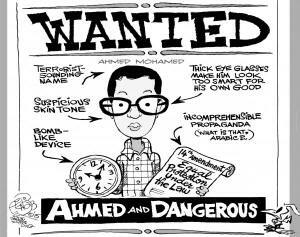 Ahmed Mohamed, an all-American boy who built a clock not a time bomb, had a bright future ahead of him in America, until anti-Muslim radicals chased him away. What is with America's rabidly insane conspiracy theories? Our country’s pack of foam-at-the-mouth, mad-dog, right-wing extremists just scored another win. For weeks, a crazed pack of these howlers had stalked, snarled, and snapped at a 14-year-old boy from Texas. Why was he under such a furious assault? Because his name is Ahmed Mohamed. He’s the inventive young fellow who built a homemade clock, assembling it from scrapped parts inside a pencil case. Proud of the craftsmanship, he brought it to his high school in Irving, Texas, to show his teachers. Unfortunately, school officials fell into a knee-jerk panic, leaping to the conclusion that a teenager with an Arab name carrying a clock in a box must be a terrorist with a time bomb. Police came, seized Ahmed’s clever creation, and led him out of MacArthur High in handcuffs. Ahmed is an all-American boy, born and raised here by middle-class parents in the Land of the Free. His clock was not a bomb, but…well, a clock. So he was quickly cleared by the police. But then — inexplicably — they released a photo of the clock, which was splashed all over the Internet. That unleashed a torrent of Islamophobia from kooks who still said it looked like a bomb. The right-wing blogosphere exploded with rabidly insane conspiracy theories, including that the high schooler was planted in America by Islamic terrorists, and a rash of unsubtle threats. 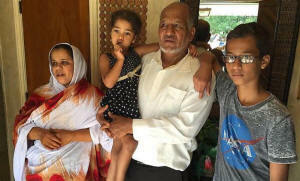 “This has destroyed the whole family,” Ahmed’s uncle Aldean Mohamed told the Dallas Morning News. “We are here for 30 years. We love Irving and want to be in Irving.” But, the family says, the anti-Islamic, anti-Arab attacks on the boy are too much. So Ahmed and family have moved to Qatar, essentially exiled from their home by American extremists. What an awful loss for America — in so many ways.